About 18 inches long. Dark bluish-gray upper parts, head, and facial markings. Off white under neck and breast, barred underside, banded wings and tail. Pointed wings. Females larger than males. 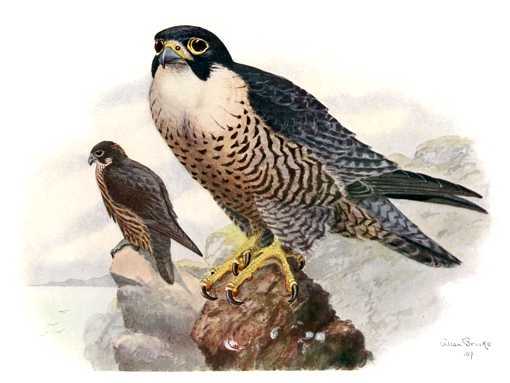 Except for polar regions, peregrine falcons range worldwide. North American peregrine falcons range from Greenland south through Canada and Alaska, into the continental United States, through Mexico, and into South America. Peregrines range beyond some of the areas in the above range map which is based on population studies spanning several decades of the peregrine’s recovery. 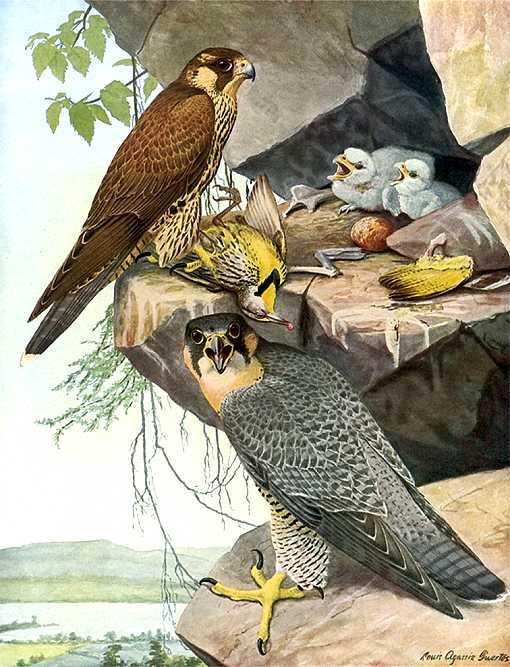 Peregrine falcons feed during daylight hours mostly on medium size birds. They attack their prey in the air, often diving at speeds more than one hundred miles per hour. They will also feed on rodents, small reptiles and insects. Females usually lay three to five eggs which hatch after about a month and young fly in about one and one half months. In the wild, they have generally nested on high, cliff edges, usually under some kind of overhang. They scrape out an area but add no nesting materials. In recent times, increasing numbers of peregrines nest on tall buildings, bridges and other structures in cities. In the wild, they have generally nested on high cliff edges, usually under overhanging rocks or vegetation. They scrape out an area but add no nesting materials. In recent times, increasing numbers of peregrines nest on tall buildings, bridges and other structures in cities. Some have made artificial structures for peregrines, although it’s questionable if they need assistance.